1. Die cut two rectangles from white cardstock. Take one rectangle, center it over your Gingerbread Man die and cut out. Keep the rectangle with the Gingerbread Man. 2. Ink the rectangle (with the Gingerbread Man cut out) using a Jumbo Dauber first with Memento Luxe Toffee Crunch and then highlighted with Memento Luxe Espresso Truffle inks to darken. Allow to dry or heat set with a heat tool. 3. Stamp the snowflakes with VersaMark, then heat emboss with white embossing powder. 4. Adhere the inked rectangle die-cut to a white cardstock base cut to the same size. 5. 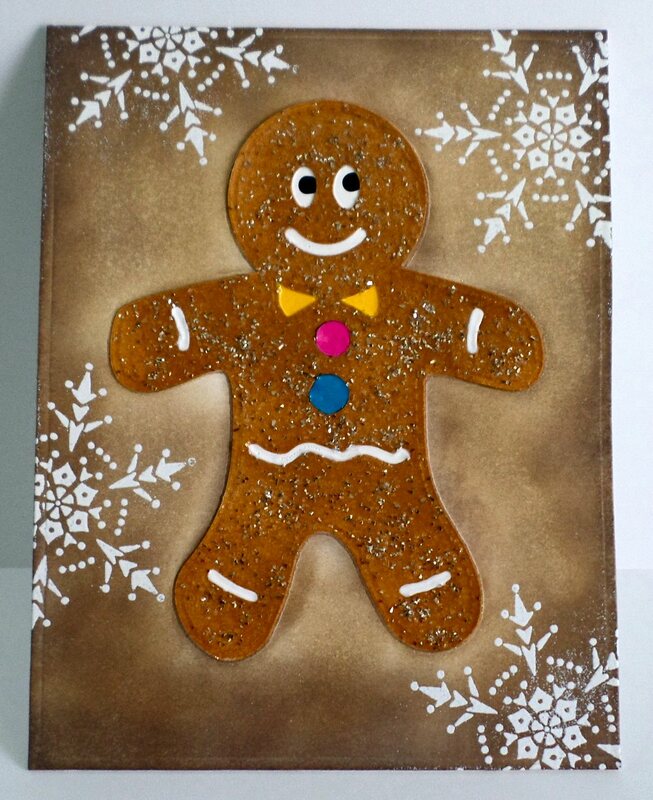 Ink up the Gingerbread Man using a Jumbo Dauber loaded with Memento Luxe Peanut Brittle ink. 6. Generously spray with Goosebumps Shimmer and sprinkle lightly with German Glass Glitter; allow to dry completely. 7. Assemble your card by gluing the Gingerbread Man into the matching die cut in the assembled card base. 8. Decorate the Gingerbread Man with a faux icing of different colors of irRESISTible Pico Embellishers. This entry was posted in Cards, Sharon Morrison. Bookmark the permalink. This is so awesome!!! LOVE the “icing”! TFS! This is awesome! He looks so dimensional – perfect color, too. Brilliant! LOVE the sparkle & texture!! !